Cheniere Energy has received government approval to build the first natural gas export facility in the lower 48 states. Critics fear fracking fallout and price spikes. NEW YORK (CNNMoney) -- The government approved the first ever natural gas export facility in the lower 48 states on Monday, clearing the way for a project that could be a significant job creator. But critics argue that, just like the Keystone pipeline expansion, building this project will have environmental impacts far beyond the plant itself. They also say it could raise the price of natural gas in the U.S. The Federal Energy Regulatory Commission voted in favor of Texas-based Cheniere Energy's plan to build a giant natural gas liquefaction and export terminal at Sabine Pass, which straddles the Texas-Louisiana border just north of the Gulf of Mexico. Although environmentalists have threatened to sue to stop the 500-acre, $10 billion project, Cheniere says it plans to start building before July. Analysts agree that the project should proceed as planned. "We do not see any items hampering the timely start of construction," Christine Tezak, an energy and environmental policy analyst at asset management firm Robert W. Baird & Co., wrote in a research note Tuesday. 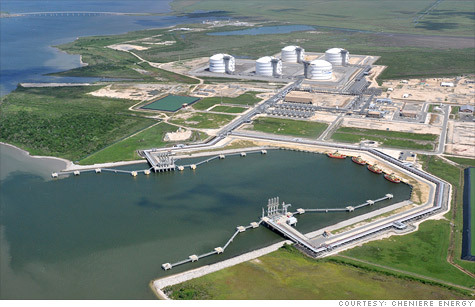 For Cheniere (LNG) and the energy industry at large, getting government approval is huge. Cheniere says the plant itself and the natural gas extraction needed to fuel it will support between 30,000 and 50,000 jobs a year. The United Sates is currently experiencing a boom in natural gas production, largely thanks to the controversial process of hydrologic fracturing, or fracking for short. All the big oil companies, including BP (BP), Exxon Mobil (XOM, Fortune 500), and Royal Dutch Shell (RDSA), are now participating in the boom. But the surge in production -- without any way to export it -- has caused a collapse in natural gas prices in the U.S. The gas industry sees exports as crucial to keep the boom going, along with the thousands of jobs the boom has created. Natural gas can command five times the U.S. price in Asia or Europe. It can be used as a home heating fuel, burned to make electricity, or used in chemical or fertilizer production. Cheniere's application was the first the government approved. Applications for seven other facilities around the country are pending. If all are approved, the nation could end up exporting one-fifth of its current gas output. That's something critics are working to stop. Fracking is a big reason why. Opponents say an increase in gas exports will lead to an increase in fracking. Fracking involves injecting sand, water and chemicals deep into the ground to crack the rock and allow the gas to flow more freely. Some fear it is contaminating the ground water and leading to earthquakes. Critics also say it could lead to an increase in natural gas prices in the U.S.
That could harm not only consumers who may pay more for heat, but also manufacturers that could pay more for electricity and materials. That "could potentially have catastrophic impacts on U.S. manufacturing," said a report on the matter from House Democrats on the Natural Resources Committee. The Department of Energy, which must issue permits to export gas along with the approval needed from FERC, has promised to study the impacts on price before giving the go-ahead for any more facilities. That study was due last month, although DOE recently said it has been delayed due to issues with a subcontractor. Many analysts don't expect to see the study until after the presidential election.